MONTREAL - A group of disabled Quebecers expressed a long list of grievances at a downtown march Sunday, shining light on the many challenges faced by one-in-10 Quebecers who live with a disability. “We’re seen as victims, but treated like garbage,” wrote Richard Guilmette, founder of the Handicap Quebec Citizen Movement, on an online invitation to the event. 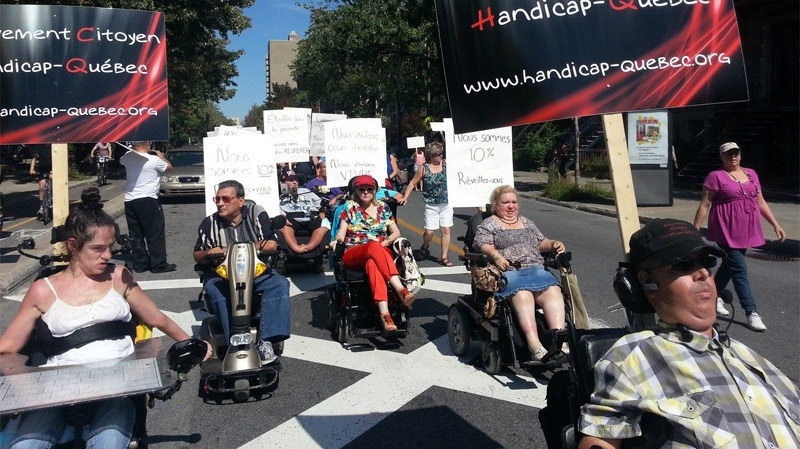 The march was launched to bring attention to transportation, housing and financial issues which plague many of the 765,000 disabled Quebecers. Most people with disabilities live below the poverty line and many have no choice but to live in special long-term care housing, called CHSLDs, rather than at a standard home, which would cost taxpayers a fraction of the price, according to Guilmette. “We will lose our freedom and dignity living in these facilities,” said Guilmette. CHLSDs are not ideal for people with disabilities, said Guy Simard, who lives in one. The group also takes aim at the government’s job-service program, which is seen as a cutback. Under that program, a disabled person is entitled to a maximum of 44.5 hours of home service per week at a minimum price of $12 per hour, which represents just under $28,000 worth of assistance per year. It would cost less to put more money into this program, according Guilmette, rather than pour more cash into the CHSLDs, where the annual cost of housing a disabled person costs $90,000 per year. A spokesperson from the Social Services Ministry’s office said no one was able to speak on the issue Sunday, but sent a statement to CTV Montreal stating that in April, an additional $10 million was added to the budget for disability programs, bringing the total annual budget to $45 million. The spokesperson said the investment included housing projects for people with disabilities. Health Minister Rejean Hebert also introduced new methods of providing care and long term care services tailored to people with significant and persistent disabilities. Transportation is another issue which brought demonstrators onto the downtown route Sunday, as the dedicated bus system often falls short of needs and many buses remain unable to take wheelchairs and metros are also largely inaccessible. Out of 68 metro, only seven are accessible, and about half of the city’s buses have wheelchair ramps. “It’s very, very hard especially during winter sometimes you can wait for three buses get on the bus,” said Linda Gauthier, a disabled rights activist. “I’m going to protest against (Plateau borough Mayor Luc) Ferrandez because he refused the elevator for people with reduced mobility at the Mount Royal metro for urban planning reasons,” wrote Andre Lapointe on Facebook. Some demonstrators said accessibility for people with disabilities become such a problem, they plan on filing a complaint with the human rights commission for discrimination against the Quebec government. The march started at Lafontaine Park early Sunday afternoon and ended outside the premier’s downtown office at McGill College and Sherbrooke.